Which cable cross-section is necessary for our offshore cable to transfer the required power from our wind turbine without simultaneously exceeding the maximum temperature? Saving copper worth several million euros by reducing the cable cross-section for an offshore wind farm. Our customer contacted us after his supplier offered him a cable. His suspicion was that the cable offered was oversized and therefore unnecessarily expensive, however, he was unable to present any proof. Therefore, he requested to have the minimum required cable cross-section calculated. According to IEC 60287-3 standards, it is permissible to use a recognized calculation method when determining cable cross-sections. The standards are provided in tables however these justifiably contain unspecified amounts of safety factors. We solved the problem with COMSOL Multiphysics. 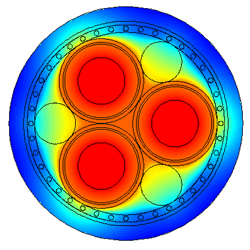 As certified COMSOL consultants, we knew how to solve the problem quickly despite its complexity. The challenge with this solution was to accurately model the cabling’s unique installation scenario along with its ambient conditions as well as simulating a typical load profile. Taking all influential variables into account we were subsequently able to calculate the exact cable cross section required thereby giving our customer a clear recommendation for action. The fact that the client was able to increase the current carrying capacity on the recommended amount of cable cross-section by 20% saved them several million euros.